Today, Ari forwarded me a link about a very interesting build which I think is the pinnacle of passion and dedication. 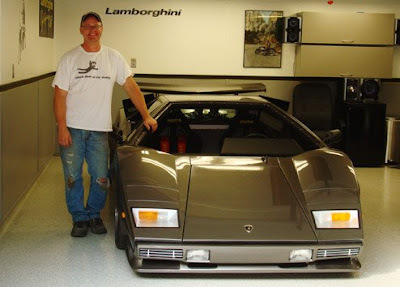 The post covers the story of a man who decided to build his own Lamborghini Countach replica in his basement after seeing one in Cannonball Run. If you read the article, it mentions several times how when the car was done, it was "dragged out of the subterranean depths" or "extracted" from his basement. In reading the article, I thought this simply meant that the car had never seen the day of light over the 10 year build period, so they chose their words accordingly to hype the act of the car finally being finished. After finishing the article and looking at the pictures, I noticed that I read too far into it and they meant exactly what they said - the car was literally dragged from the basement after knocking down a section of the house's foundation! All along, I was thinking there was a garage door and a driveway leading up to the basement, but apparently not. I'm pretty passionate about cars (some more than others) and when it came time to build a replica of my favorite, I don't thing the thought of building a car in the basement knowing i'd have to tear a hole in my foundation once it was done and drag the car out would ever enter my mind as reasonable. All the more reason to believe that maybe if there was a build program for the Lamborghini Countach somewhere near his home he may have been able to finish his dream with the same result, but faster and without the headache of worrying that the house would come crashing down on all of his hard work as it was dragged from the basement! This type of passion and dedication to an automotive dream is always inspiring...Go Local! "Actually getting the car out of the basement was pretty straight forward to be honest. I built a skid to put the car on — a trailer without wheels you might say. The rig is basically an angle iron frame designed to make it down into the basement to which I added 4 swivel casters to move the car to the opposite wall. We used an excavator to dig a ramp and then cut the block of the foundation out. We pushed the car to the opening, hooked it up to the excavator and pulled it out. Simple. I was like an expectant father watching it come through the wall. I was literally shaking and running the supposed plan over and over in my head. 'Have I overlooked anything? Is some of the wall going to fall on my work of seventeen years?...' The blankets I covered it with surely wouldn't stop that from happening, but I worried nonetheless, an it was in the end, worry for nothing. It went as smooth as something like this could. The neighbors started gathering around as it emerged, waiting for me to remove the blankets. It was like a artist unwrapping his masterpiece. I had never seen it in the light of day either. As the last blanket and car cover were removed I knew at that moment I had accomplished what I had dreamed about so many years ago and to see it sitting there in front of me was surreal. The whole process took two and a half hours and there it was, my Lamborghini safely in the garage. The next day we filled the hole in the basement with new block in no time it was good as new." We had a great call with Josh from Fiberforge today, discussing the possibilities of incorporating their technology in the Rally Fighter and future LM models. With each discussion, we learn more about the technology and what parts we could use it for, and how to manufacture those parts for the best results. It's all going to come down to finding the part that is the right fit for our ideals of lightweight, rigidity, sustainability just to name a few key things, and of course, cost. The Fiberforge technology seems to make the most sense in replacing parts made from flat planes in areas with complex curvature and a deep draw where rigidity is key. Check out the link above for a look at their updated website to follow along with their cutting edge process, just as we have done over the last few months. Who Says We're Too Old to Still Be Playing with Clay? Today I received some photos from Steve at Automotive Technology Group, who has been handling the milling of the 1/4 scale model, and most recently the clay model which is also 1/4 scale. As you can see from the photos, it looks amazing and I can't wait to see it in person, but for now it will be in the hands of West Coast design team of Ben and Dale (with Aurel back here in Wareham offering support) so the next round of the design process can commence in the most efficient and effective manner possible. We engineers, will just have to continue working in the virtual world for now. It's another wheel/tire that we will use with one of our scale models, but the difference from the original wheel and tire combo we first made is that this model is a bigger rim (20" vs. 17") and lower profile tire. 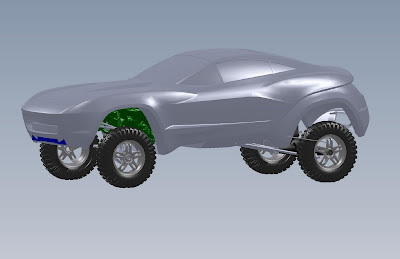 We'll use the new wheel/tire combination to assess the feasibility of the Rally Fighter at a much lower stance than the off-road configuration. These images are of the wheels fresh out of the printer, so not to worry, once the final prep work has been done, the true color of the wheels (Aluminum) and the tire will come out and will help the models to really pop when you see them, which could actually be in person if you plan on attending the meetings our team has set up on the west coast as referenced in Ari's Blog! Not to worry if you can't make it - we'll be sure to post plenty of pictures of the new clay model with the wheels in place so we can gather your all important feedback on the latest iteration of the mighty Rally Fighter, so stay dialed in! This is a pairing of the latest surface data from Dale and what Dave and I have been working on over the last week. You can see that the engine is in place as well as the suspension both front and rear. We've been inserting as many components as possible into the assembly to package the vehicle and design the chassis. One of the main things we're using the model for is to check suspension travel and how it affects both packaging and performance. Stay tuned for more info and images on those studies.